Perceptual Noise Reduction (PNR) is noise reduction done using a perceptual (non-linear) frequency scale. There are a variety of different scales to use, such as the currently most popular Mel scale, the fallen out of favor Bark scale, its replacement the Equivalent Rectangular Bandwidth (ERB) scale, the slightly more obscure Greenwood scale, and the musically important Octave and Third Octave scales. Here we will investigate the performance of the Mel scale and the Bark scale versus the standard linear frequency scale in the Oracle Spectral Subtraction Additive Noise Reduction Algorithm to see just what all the fuss is about. Generally, a perceptual scale is defined either as a bijective function of frequency or as a discrete binning of frequency or both. To convert using a continuous scaling, we need to first construct a filter bank. In practice, once the filter bank is constructed, we work the same way as in the discrete case. That is, we use the bank to discretize the linear frequency scale into N bins, and determine a set of coefficients that will be used to represent the information in the linear frequency scale in our new perceptual scale. It is quite straightforward to append a half triangle to cover these two bands to partition the whole Nyquist bandwidth properly, however there is very little speech information in these two bands, so it is usually not an issue in practice. In fact, it has the benefit of largely attenuating the dreaded 60Hz hum and high frequency noise. Either way, discretizing the mapping has lost injectivity but its surjectivity has remained. The preservation of surjectivity admits a hash between pep bins and frequency bins such that many standard noise reduction algorithms can still be employed except now using a perceptually motivated frequency domain spanning set. 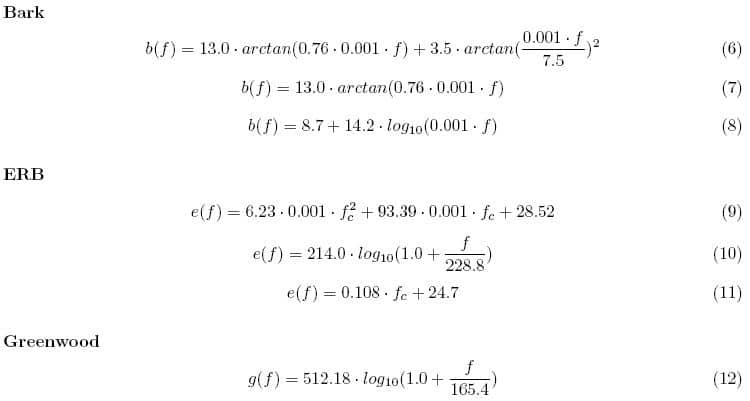 All of this seems like a lot of computation, but fortunately for us in using Short Time Fourier Transform (STFT) solutions, we already know the set of time domain and frequency domain frame lengths we will be using so this hash can be computed offline and loaded in an Abstract Data Type (ADT) for easy reference. In all of this general talk about perceptual scale conversion, where are the concrete examples? To satisfy this hunger, we will briefly touch on two scales given by very different representations. The Mel Scale is given by a continuous representation , while the Bark scale was originally defined only as discrete bins. In 1980, Zwicker published a few analytic approximations to the curve  which can be found in . 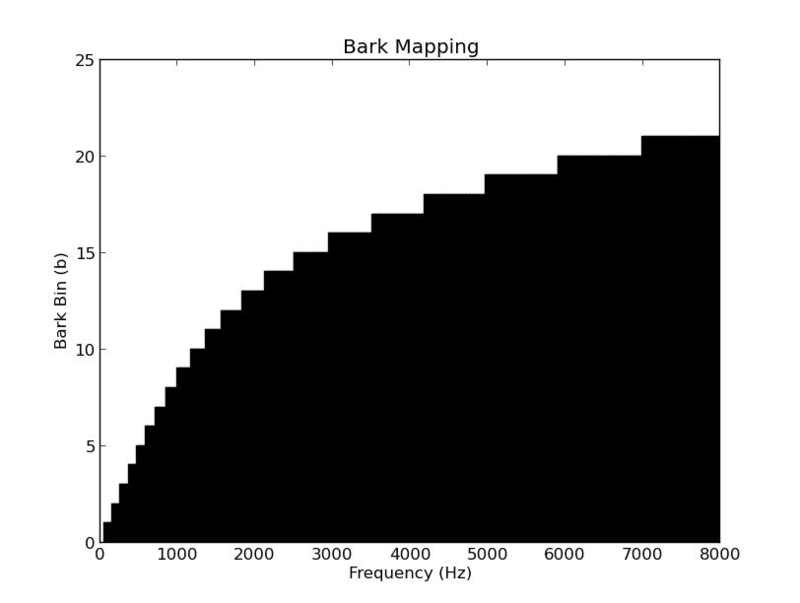 It should be noted that there has been more recent work that has approximated a continuous transformation for the Bark scale  in order to use it for digital audio with CD sampling rates. From this mapping, the steps in the previous section can be employed to discretize this scale for perceptually based speech enhancement applications done in real time. As the figures show, Mel and Bark and ERB have very different normalized increment rates. Therefore, we expect different behavior from these scales when used in standard speech enhancement techniques. The question is, how is this behavior different, and is it different enough to be able to select which one is better? To get an idea of the ultimate utility of these scales in noise reduction, we propose a Semi-Oracle spectral oversubtraction experiment to remove additive white Gaussian noise. It is an Oracle technique because the noise is generated as a subroutine and added to a clean speech signal in the time domain to each frame, therefore we have complete access to all the statistics of the noise and clean signal. It is only Semi-Oracle because we chose to use only the noise magnitude and psd information, and not the clean phase information. This is to give an upper bound to the situation where we have very good estimation module for a magnitude based enhancement algorithm. We chose Spectral Oversubstraction because it is a versatile technique suitable for real time processing, adaptable to other problems, and will easily show the effect of the non-uniform binning in the calculation of the Noisy Signal to Noise Ratio (NSNR) and application of the gain function. 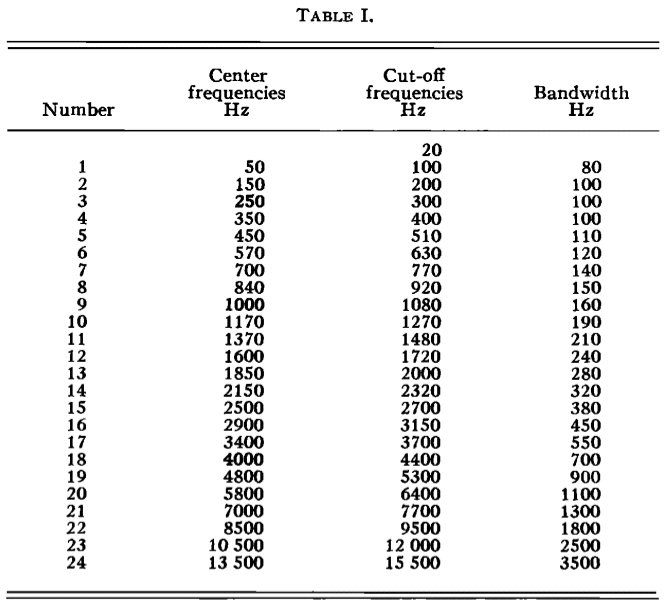 In this experiment, the frame size was 32msec sampled at 16kHz with an overlap of 75%. The speech sample was “Screen the porch with woven straw mats”, a Harvard Sentence, taken from the 16k-LP7 TSP Speech database. Again, for reconstruction, the noisy phase was used as is, per usual with magnitude based enhancement algorithms. We will look at the results of using an FFT scale, the Mel scale, and the Bark scale at -10dB and 10dB SNR. As the results show, there is much more musical noise for the FFT case. This is apparent in the random speckling of high energy short time strips found in the FFT spectrogram. 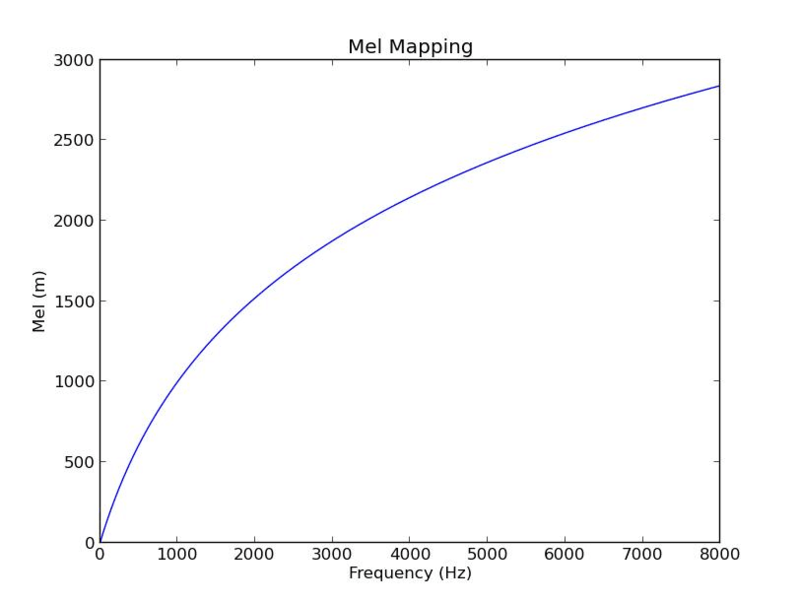 The Mel result has much less musical noise, but there is more attenuation of the unvoiced sounds. However, the residual noise is more even in the Mel result than the FFT result. The Bark scale seems to be an intermediate of the two. Here, there is more musical noise than the Mel case, but less than the FFT. 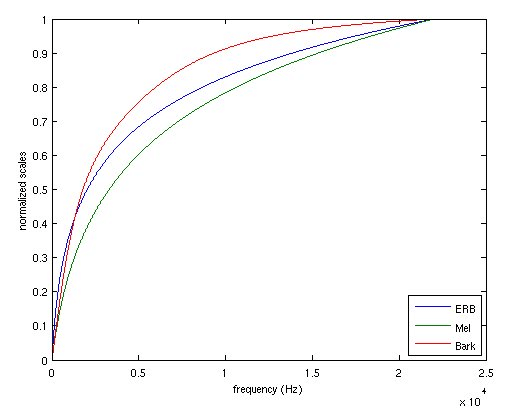 In addition, there is less attenuation of the unvoiced sounds than the Mel result, but more than the FFT. Here is where the Mel and Bark Scales really shine, and shows just how bad a simple Spectral Oversubtractor is as a noise reduction algorithm for the standard linear frequency scale. As you can see from the picture, the FFT result still has residual noise and is plagued by musical noise. The Mel and Bark results in contrast have virtually no musical noise and virtually no residual noise. In this article we considered constructing a general perceptual scaling for speech enhancement in a computer. 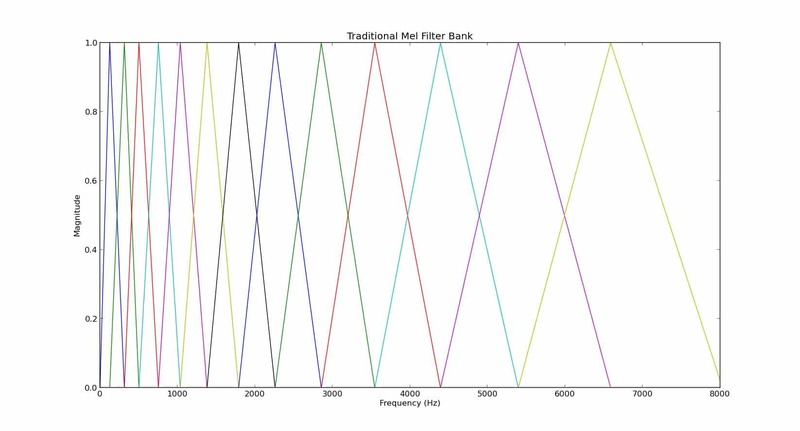 We examined two scales, the Mel and Bark, and compared them in a noise reduction experiment with the standard FFT. It seems that these perceptual scales may be the preferred scales to use, at least in magnitude based noise reduction algorithms. Further work will be concentrated on examining the performance using standard methods of noise statistic estimation, and comparing how using a discrete bin representation as given by  and applying the filterbank approach illustrated here using approximations in [3,4] effects performance. NOTE: Appendix A contains some analytical approximations to various perceptual scales, and Appendix B contains a mapping from Bark Band to FFT Bin for a 32ms window sampled at 16Khz. Giampiero Salvi, “Auditory Scales” Internet: http : //www:speech:kth:se/giampi/auditoryscales/, Sept. 03, 2008 [June. 13, 2013].